A multicultural story of extended-family love. One of childhood’s most common minor tragedies is converted into an imaginative adventure. 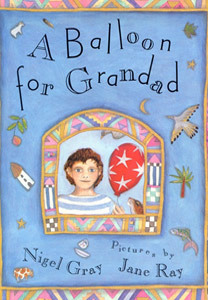 A Balloon for Grandad follows the flight of an escaped balloon over a variety of landscapes – forests, deserts, mountains, and oceans – in its journey from Sam’s home to his grandad’s house on an island in a river in Africa.